What is a library barcode and how do I get one? Most users of the SFU Library (SFU students, faculty, and staff) can use their SFU computing ID to log into the Library Catalogue, and access licenced Library resources from off-campus. If you have an SFU ID card but not an SFU computing ID, follow these instructions to use your barcode to access Library resources. 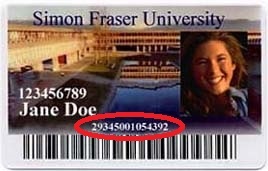 Your SFU Library barcode is the number that begins with 29345... on your SFU ID card, which is also your library card. It is not the same as your student number. Your barcode is private information. Do not share your barcode with anyone or use it for any purpose not expressly permitted by the SFU Library. Log in to access online resources and request items from other libraries (eligible borrowers only). Use for barcode number to log in to the Catalogue. If your last name is at least 8 characters long, your password will be your last name as it appears in your Library record (case sensitive). Note: your password is case-sensitive: MacKenzie is treated differently than mackenzie. also have the number 1 as a place holder up to 8 spaces. You have the option to reset your password by clicking on: 1) Need help signing in? and then 2) Click here to reset your password.